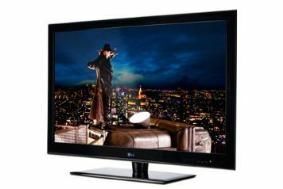 LG 42LE5900 review | What Hi-Fi? As with other sets in LG's vast TV range, the 'LE5900 isn't short of style, thanks to a slimline profile and subtle red paint job. There's substance to the features and connections, too. Highlights include an integrated Freeview HD tuner, four HDMI inputs and two USB inputs, through which to play JPEG, DivX HD and MKV files, among others. The set's ethernet socket allows you to hook up to the internet and enjoy LG's NetCast online content service, while the TV is also DLNA certified, providing you with the ability to stream media files from compatible sources such as a home PC or mobile phone. Watch standard-definition broadcasts on the LG and there's nothing to get too excited about. Detail levels are fine for the money but there are traces of noise and instability. Make the step up to Freeview HD content and there's a jump in image clarity and edge definition, but once again, the likes of the Sony KDL-40EX503 deliver greater fine detail and realism. Spin Michael Jackson's This Is It Blu-ray and the LG hits you with a bright, punchy image that does a good job presenting the show's stage settings. Black levels are impressive and there's good detail in the shadows of the stage. However, colours appear unnatural and overcooked, and there's a lack of subtlety with skintones. As with the Freeview HD picture, the LG's best rivals have the edge on fine detail. Also, the speakers serve up thin, weedy sound, and dialogue lacks substance. So, the 42LE5900 represents a slight dip by LG's recent high standards. It's not a bad TV, but there are cheaper, more capable sets out there.